A review in 10 words (or thereabouts) : I see dead people. Watch out dead people, girl with wicked bells and sword coming. Sabriel is a necromancer. Raised as a Charter Mage to respect and wield Free Magic, Sabriel enters the Dead to return lost souls to their proper place. But when her father, the Abhorsen, goes missing, Sabriel realizes how much more she has to learn and how dangerous the forces of evil in the Old Kingdom can be for the living. She must travel through the Old Kingdom to find his body and bring him back to life before he is lost forever. For the longest time I couldn't put my finger on why I loved this book so much. Then, while perusing reviews on Goodreads, I better understood. One reviewer discussed the importance of magic in the book, beyond just a secondhand plot point. Magic is the core of the story, weaved very intricately into the history and legacy of the people that populate the pages. It's not just a plot device...it is the plot. And this is make some things float around magic. This is dark. And evil. And powerful. Nix doesn't hold any punches with his magic which gives the story depth and originality. While I hate talking animals, I'm giving Mogget a pass because he's only disguising himself as a cat. He's snarky, stubborn, completely pessimistic, and a whole lot of fun. His inner-demons are truly horrifying and spectacular. I had some trouble visualizing this particular book. As much as I loved it and was completely engrossed int he story, I felt like my imagination was broken. I couldn't picture scenery and faces. The story seems both old world and new. Sabriel goes to a boarding school, but people carry around swords. Offices have metal filing cabinets but people wear robes and cloaks. It seemed the story was set in two times which was a bit unsettling. I loved this book. 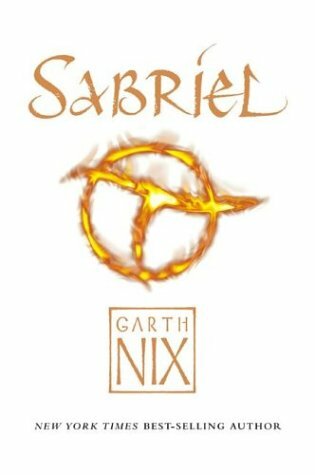 I've been glancing over Sabriel on the library shelves for years, giving it a glance but never really getting an urge to check it out. Thank goodness for book club! This was simply a great fantasy novel. It's is stuffed full of tense, harrowing moments that leave you on the edge of your seat, reading as quickly as possible to make sure the characters are okay. The characters are memorable and sympathetic and the evil is tense and terrifying. 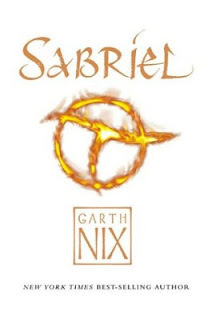 If you're a lover of fantasy, adventure, coming-of-age, magic awesomeness, check out Sabriel by Garth Nix.